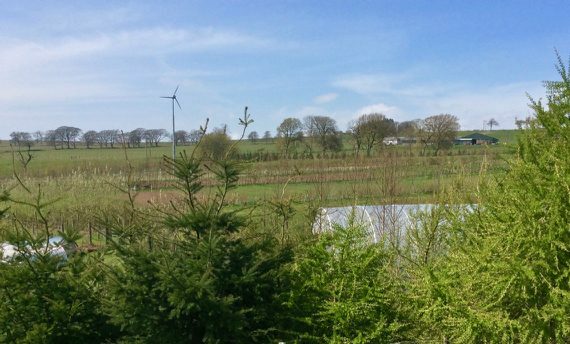 Agroforestry is a system that combines trees and arable crops in order to boost productivity and biodiversity. 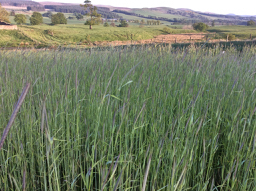 Cereals – we grow small areas of (mainly) heritage varieties of wheat and oats as part of Scotland The Bread’s research, with the triple aims of acceptable yield, bread making quality and nutritional density. Vegetables – we grow a wide variety of vegetables to feed the household, volunteers and the participants on Bread Matters courses. Fruit and Nuts – there are nut trees in the agroforestry strips, a permanent area of fruit bushes and an orchard. Mixed hedges bear fruit and berries. Grass – has, for several years, sustained a flock of organic geese, which grazed the strips of grass and the orchard, in rotation. 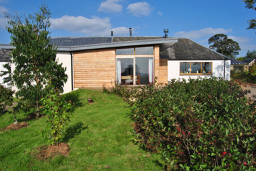 Andrew began creating this scheme in 2010 and we have planted approximately 6,000 trees and bushes to date. A rotation of cereals, grass and vegetables thrives in the broad alleys between strips of trees, which are grown for food (nuts, berries etc.) for shelter and (coppiced) for timber for the wood-fired oven and wood-burning stoves in the farmhouse. 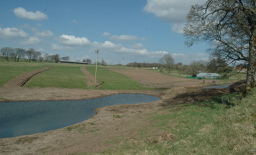 Here, on the left, are some photographs of the farm in 2011, when the first strips had been ploughed, the polytunnel and shed erected and a pond created. On the right are photographs taken from similar vantage points on 1 May 2017. Here’s a brief look at our progress, year by year. 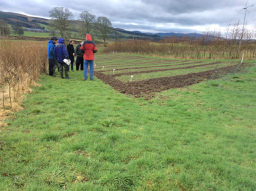 Here is how the farm looked early in the year 2017 during Scotland The Bread’s first Farm Day to see the cereal plots in March; and in the greenhouse in early May. As we brought the series of breadmaking courses to an end this year, we have had more ‘excess’ produce to turn into preserves, juices etc. 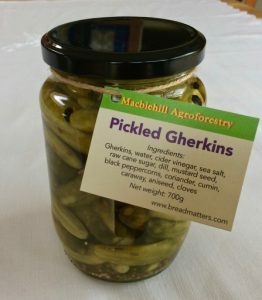 We have begun to sell these on a small, local scale, such as at the West Linton monthly market and through one or two Food Assemblies. 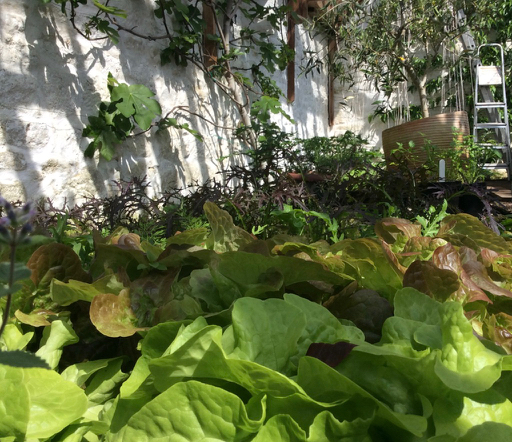 One of the pleasures and demands of growing a wide variety of food crops on a small scale is the change we need to make in our diet when there is more, or less, of something than we had expected. 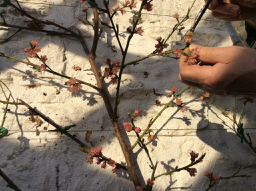 During 2016 Andrew experimented with some ‘acocha’ or ‘Appalachian Feet’ in the greenhouse. Only a few of these strange seeds germinated but they produced an abundant crop that ran into the sackload. 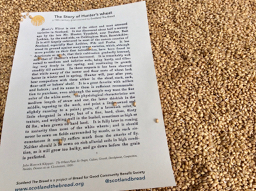 The cereal growing was very much focused on the programme of reserach for Scotland The Bread, which became a Community Benefit Society in April 2016 and opened its community share offer during the summer. 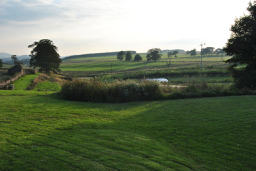 From sowing spring wheats and other trials, through hosting community growers as part of the Soil To Slice project, to shared events for the threshing, milling and baking of Scottish heritage grains, farming as a means to nourishing ordinary citizens became completely joined up with the other strands of work. 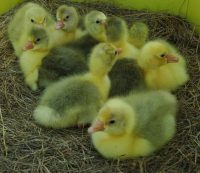 We raised a flock of geese, this time starting with about 40 two-day-old goslings rather than incubating eggs. We slaughtered and plucked them all here on the farm and sold them (reserving a handful for high days and holidays) for the Christmas table. 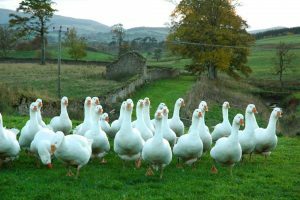 We plan to raise a slightly larger flock in the future, with different housing, but have decided that we shall have a stockless year and not raise any geese at all during 2017. 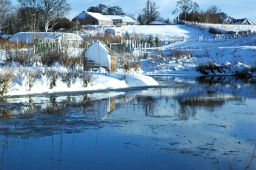 The year began with plenty of snow. By the time it had cleared and the weather had warmed a little, everything in the greenhouse was bursting into blossom. 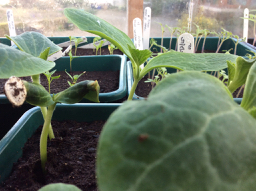 Suddenly, the light changes we can see the first pea and been shoots emerge from early sowing under cover. Emma Sinclair joined us to work two days a week, with her time divided between the organic growing and in the administration of Bread Matters. Emma had previously WWOOFed with us in 2013 and had then joined the Nourish New Farmer programme, learning in structured monthly sessions whilst working for a full season on another organic farm, Knockfarel, in the Highlands. We hosted Otesha for the first week of their cycle tour during August. 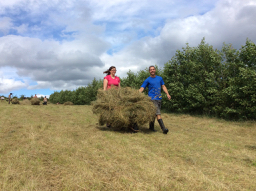 They spent a day getting to know the research and cereal growing and helping to make hay. 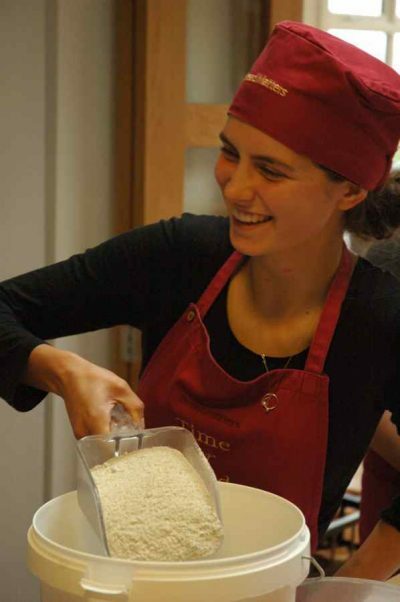 By the close of 2015 we had completed a crowdfunding campaign to raise £6,000, which was eventually matched by a loan of £6,000 from the A Team Foundation, to purchase equipment for threshing, cleaning and milling heritage grains as part of our work in Scotland The Bread. We developed the cereal research, bringing in new collabrations with Scottish science researchers. We hosted more volunteers, change makers and visitors to the farm. 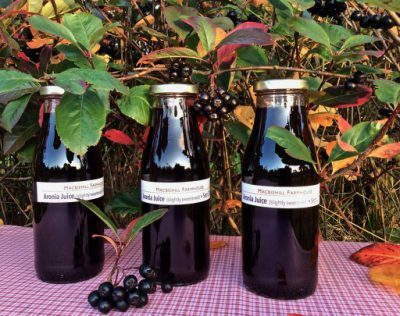 The aronia bushes planted by Sourdough Exchangers flourished, as did the diverse crops beloved of pollinators and the wildlife. 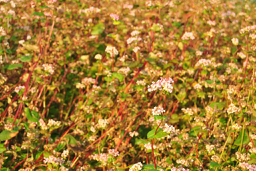 Photographs below show the aronia hedge, the caravan, a view of the farm, buckwheat, frog, phacelia, the indefatigable Théo depicting an eco system for visitors, a resident pheasant and volunteers joining a farm walk to see the cereal trials. 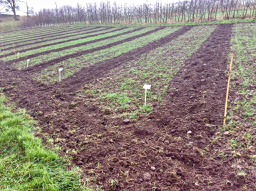 In March, 38 trays of wheat seedlings (from Shireff varieties) were brought to Macbiehill from the John Innes Centre in Norwich, where they had been germinated under controlled conditions. They had a temporary home in the greenhouse before being planted out here and on organic farms in East Lothian, Perthshire and Aberdeenshire. 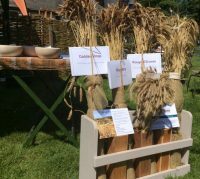 In an article published by Nourish Scotland on 2nd September Andrew described the beginning of this Scotland The Bread project to re-create a Scottish flour and bread supply that is healthy, equitable, locally-controlled and sustainable. This year is mainly about bulking up the supply of seed grain so that next year we have enough to do serious trials with the flour. 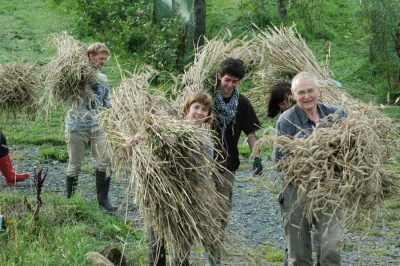 Several WWOOFers helped to transform the farm during this year; weeding, mulching, composting, planting, making hay and tending the geese. Here are just a few of the crops we grew, along with the people who have helped us to sow, tend and harvest them and, not least, to enjoy them. In March 2013, Australian WWOOFers Chris and Lauren helped us to make a head start by sifting and moving tons of compost, building new compost pens and preparing for planting. Andrew erected a wooden framework to carry an upper tier of strawberries in the polytunnel and the greenhouse (an idea he’d picked up from Colette and Joe McMahon in Bohatch, Co Clare). 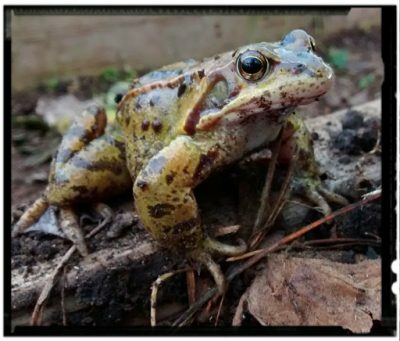 Some of the ground was treated with well-aged ‘natural liquid fertiliser’ (last summer’s collection from the wet chamber of the compost toilet; thanks again to all who contributed). By April we were incubating 80 goose eggs, putting up a new wooden shelter and coming to the end of the winter vegetables in our soups and stews. 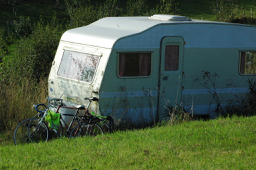 We bought a small caravan, which has been much-occupied evr since we installed it on the ‘green lane’ above the polytunnel and the orchard. 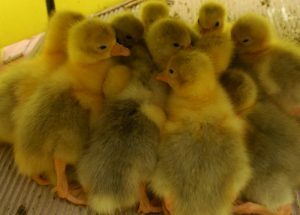 The goslings hatched on 8th May and had progressed from the greenhouse to the polytunnel by the time the first Sourdough Exchangers arrived on 14th May. 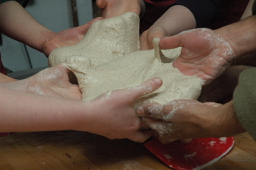 A dozen young people worked on the land and made bread together. Occasionally one of them would gather a few handfuls of chickweed and feed it to the goslings. 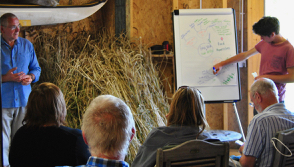 The Sourdough Exchange is a short residential course that gives change makers a learning experience in making slowly-fermented bread and working on the farm, particularly with the organic cereals. (See Farm News and Pictures fro more information on Sourdough Exchanges, here.) In September the Exchangers were able to harvest the rye, thresh it and winnow it and, the next day, to mill it and bake sourdough rye loaves. It was an unforgettable total immersion in bread from the seed to the slice. There’s a short film, ‘Le Pain se Lêve’, of the event, made by A Moment’s Peace Theatre company as part of their I Could Eat a Horse series, here. 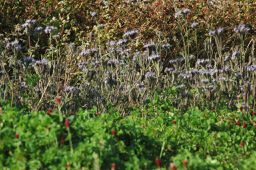 One of the first jobs for Exchangers and WWOOFers was to replace the tiny beeches, which were not thriving, with a hedge of bee-loving organic heathers from Bee Happy Plants and, beside those, a sweep of Aronia bushes. Otherwise known as choke berry bushes, these frame the view from the baking studio and attract bees whilst providing a habitat for small birds including the sparrow and meadow pippit. There was more good news for bees on Monday 29th May when the European Parliament voted to ban the use of neonicotinoids. Jubilation from us, from the many campaigners who made their voices heard and from everyone who believes that agri-chemicals have no place in or on a living, vital soil. By June the polytunnel and greenhouse were in serious prouduction.The second tier of strawberries suspended from the polytunnel rafters worked a treat. With so many salads and vegetables, berries, cereals and pulses, supplemented by eggs, dairy and the occasional piece of meat from Whitmuir Farm, our fare began to look like the much-vaunted New Nordic diet. It was simply Scottish. We discovered that whole, lightly-cooked beetroot thinnings were excellent on top of a barley risotto. We spent a good part of July and August working with WWOOFers on the land and feeding six, eight or more people with good appetites, so enormous beetroot and squash just looked supper-sized. 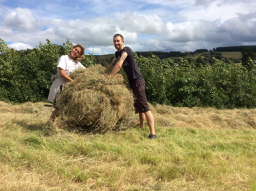 Francisco, Laura and Johannes put in many hours of physical work, making hay, mulching, planting out etc. At last the strips of trees are clearly visible and the alleys between them ready to be grazed, in rapid rotation, by the geese. Moving the flock requires a lot of shifting of fences and protecting of trees. As well as their dry food from Hi Peak and the odd loaf of bread, they have some mineral rock, which does the land even more good when it has passed through a goose. They will also, if they get a chance, eat as many cabbages as they can get their beaks on. 40 in one escapade is their record, but we don’t talk about that. We left it too late to introduce the geese to the pond, so they don’t quite know that they are water fowl and even a kayak toting cabbage wasn’t temptation enough to get them into the water. They don’t know how to count either, so will all pile into one of their three houses at night. Summer was kind to us all and we ate soft fruit every day; from when the first strawberries ripened in the polytunnel during May, until late September. The courtyard became a large herb garden and an abundant patch of alpine strawberries was established close to the house. The cereals buckwheat, rye, wheat varieties, barley etc. have done well and produced enough to bake loaves or at least to bulk up in coming years. 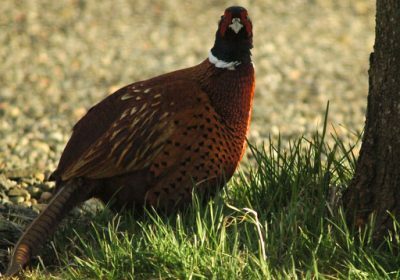 A pair of pheasants took up residence and produced three poults, adding to the demands made on the grain by mice and birds. During September we had a tour of the farm and of Scotland The Bread, for friends and collaborators, followed by the second Sourdough Exchange, this time with an emphasis on Passing It On. Autumn came, trailing all its carotene splendour, with morning mists giving way to azure skies and the changing evening light of the Borders. 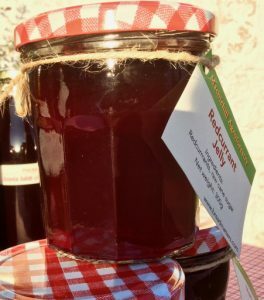 ​We produced batches of pickled gherkins, green tomato chutney, passata, jam and fruit sauces to enrich our meals during the winter months. producing salads, beetroot, potatoes, onions, peas, beans, courgettes, cabbage, herbs etc. for the household and guests.